Reminds me of the old Fuzios. Uwaaah! This is cool. The hair on it looks cool too. It looks like a hair nutsac. LOLOLOLOL!!!! 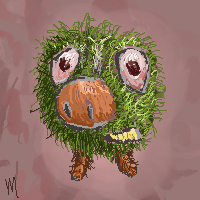 it's a cross-breed between a grass-ball and piggy right? the green furry thing is really cool!